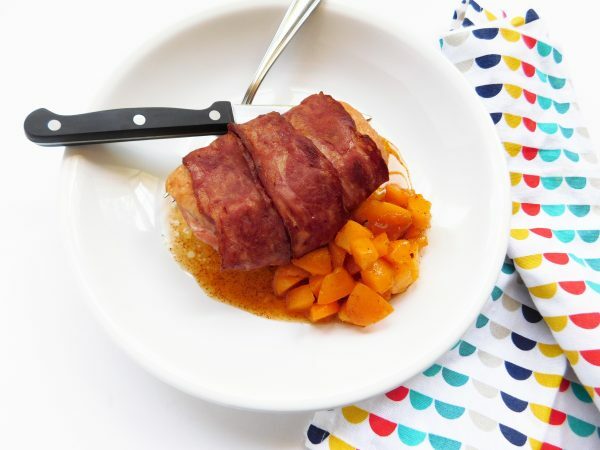 Delicious duck breast is wrapped in duck bacon then topped off with chili apricots. The perfect mix of spicy and sweet. Great on the grill or in the oven. Make sure that the duck breasts are unthawed. Pat each one dry then place on a rack. Open 1 package of bacon then wrap atleast 3 pieces on each breast. You won’t use the whole package so what I did was add the bacon to the sheet that I baked these. Preheat the oven to 375 degrees and they should be done in around 1 hour. Remove the pit from the apricots and chop. Add the preserves, salt, red pepper and chili powder. Check the final temperature to make sure the duck is cooked all the way through. It should be at internal temp of 165 degrees. Top with the apricots and enjoy!